#3 "Hosts of Battle, Ancient Evil, Cavatore Keep"
Take up your weapons, bold warriors, for this issue we have a full set of rules and army lists for you to try out upon the field of battle! (Okay, it’s a table top, but still damn exciting). 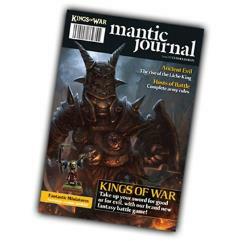 With more gaming content than ever before, including rules and background for the dreaded Liche King (a finer model of undead evil you’ll never see), this issue of the Mantic Journal is the best yet.